California Gov. Gavin Newsom unveiled several health care initiatives in his inaugural address last week, including a well-publicized plan to lower drug costs using public purchasing power. But a less-publicized action – establishing a state surgeon general post – to help tackle the social determinants of health and health equity, presents a significant opportunity for a state as diverse as California. The idea is not a new one. In 1996, Pennsylvania established and still maintains a physician general position. In the decade that followed, Michigan, Florida, and Arkansas governors also appointed state surgeons general, though Michigan eliminated the position in 2010. Strengthening the state’s public health infrastructure. The states usually house the surgeon general in their departments of public health, including Florida where the surgeon general also serves as the health department’s director. The Arkansas surgeon general holds a joint appointment with the University of Arkansas’ School of Medicine. California’s proposal emerges at a time when health disparities are increasing and there is a growing consensus that health can only be fully achieved when we address economic and life circumstances — such as housing, education, and jobs — that can contribute to poor health. Gov. Newsom has charged his new surgeon general to address these social determinants of health. We will soon report on the health care initiatives that governors across the country address in their 2019 inaugural state-of-the-state addresses. Many will be following the Golden State’s actions to learn more about the role and responsibilities of its new surgeon general. We want to see how this latest iteration of the position helps advance the governor’s comprehensive approach to improving health for all residents through cross-sector reforms. 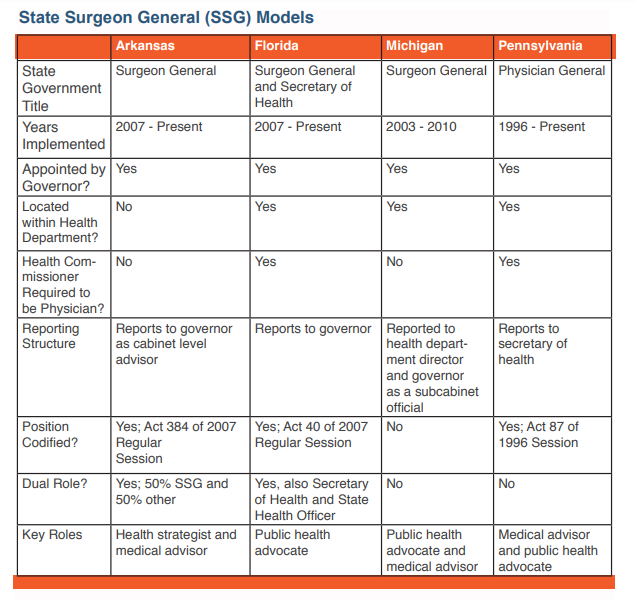 Below is a chart from our report, Advancing Health Care Transformation through a State Surgeon General Model: Opportunities and Challenges, which details the roles and responsibilities of surgeons general in Arkansas, Florida, Michigan, and Pennsylvania.